In this video, Cray CEO Pete Ungaro announces Aurora – Argonne National Laboratory’s forthcoming supercomputer and the United States’ first exascale system. Ungaro offers some insight on the technology, what makes exascale performance possible, and why we’re going to need it. Cray was selected to deliver the system, as a subcontractor to Intel, to the U.S. Department of Energy’s Argonne National Laboratory in 2021. The program contract is valued at more than $100 million for Cray, one of the largest contracts in the company’s history. 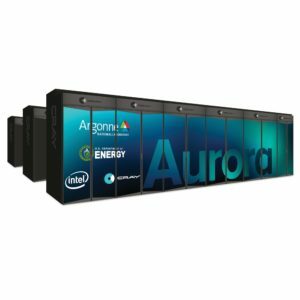 The Argonne system, named Aurora, will be comprised of more than 200 Shasta cabinets, Cray’s unique software stack optimized for Intel architectures and the Cray Slingshot interconnect, as well as next generation Intel technology innovations in compute processor, memory and storage technologies. Aurora is a Cray Shasta supercomputer with additional compute and accelerator infrastructure provided by Intel. Announced in October 2018, Shasta is an entirely new design and is set to be the technology to underpin the next era of supercomputing, characterized by exascale performance capability, new data-centric workloads, and heterogeneous computing. This is the second major win for Shasta systems in the last six months. NERSC, the National Energy Research Scientific Computing Center, chose a Cray “Shasta” supercomputer for its pre-exascale system, named “Perlmutter.” That Cray contract was valued at $146 million. Shasta was designed to meet the demanding and evolving needs of the exascale era with the flexibility to support current and future processing architectures for years to come. Aurora will be powered by a range of next generation Intel technologies including a future generation of the Intel Xeon Scalable processor, Intel’s Xe compute architecture, Intel Optane DC Persistent Memory, and Intel’s One API software. Cray designed the Slingshot scalable interconnect to handle the complex processing and communication of HPC and AI applications to run on exascale systems. Slingshot is a complete rethinking of the interconnect for extreme scale and has added novel adaptive routing, quality-of-service, and congestion management features.